The time has come to announce that Foreigndub have now been bringing you quality events and music for 10 years. Foreigndub have been bringing the masses together since November 2002 with their first & sold out show headlined by Brazilian Dj Patife and Cleveland Watkiss. Since, Foreigndub have toured many many select artists and have performed and hosted many many shows. This includes Dj Marky & Stamina MC, Big Bud, Calibre & DRS, Nu:Tone, High Contrast, Asides, Total Science, Makoto, Icicle & Kenny Ken from the drum n bass genre. Like all crazy people Foreigndub have a split personality and also delve into dub reggae and dancehall. This Bass driven personality will be showcased at the massive 10 year celebration. Arising from this collective in 2006, drawing from a wealth of local producers and bands performing at their events, the Foreigndub Label was launched and since has had over 20 releases from artists such as The Bird, The Versionaries, Basscamp, Dubwize, Reality Chant, The Nomad, Sweet Az Soundsystem, Kakhand, Ishu, Agency dub Collective, PBass Expressway, Kobra Kai & Mars Sunset. To celebrate this we have a very special guest from Scotland – Mungo’s Hi Fi in an intimate inner west warehouse. Sound will be provided by DSS & Foreigndub. 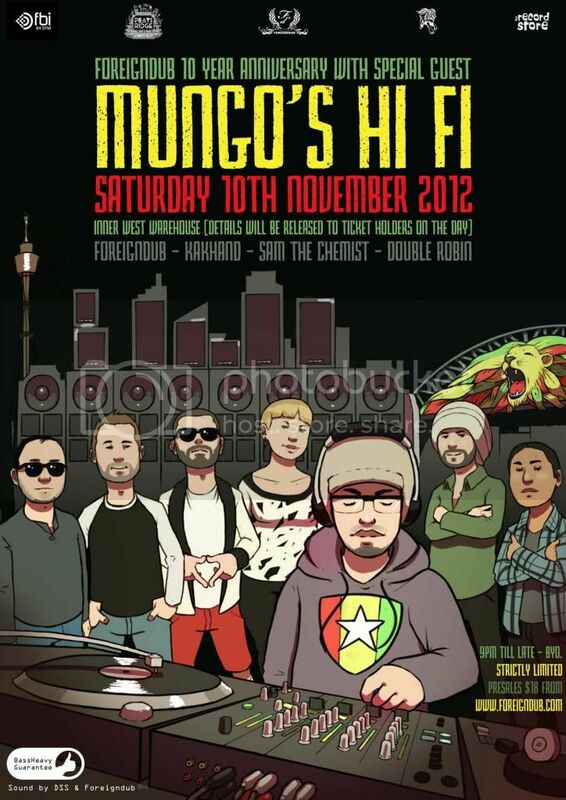 Mungo’s Hi-Fi are a dub reggae, dancehall and dubstep soundsystem in the original roots tradition based in Glasgow. Tom Tattersall, Douglas Paine and Craig Macleod debuted in 2001 with Wickedness feat Brother Culture on London’s Dubhead label, taking the dub world by storm and getting heavy plays from Jah Shaka and Iration Steppas. Mungo's Hi Fi champion the evolution and are re-invigorating soundsystem culture. They have developed formidable live shows, collaborating with foundation legends like Ranking Joe, Sugar Minott and Sister Nancy as well as top vocalists on the scene at the moment including Kenny Knots, Mr Williamz, YT and Scotland's own lyrical lassie Soom T.
The live work feeds directly into the studio productions. Mungo's crucial releases, mainly on their own Scotch Bonnet label, have topped the reggae bestsellers on numerous occasions. 'Soundsystem Champions' their Double LP released in 2008 has turned many on to their sounds and their massive new album 'Forward Ever' has recently been released, supported by tours in Japan, Mexico and the USA, as well as live shows on their soundsystem touring throughout the UK and Europe. Catch the Mungo's Hi Fi experience in Sydney on Saturday the 10th of November for a very special night with sound provided by DSS & Foreigndub. WHO: MUNGO’S HI FI Alongside Foreigndub, Kakhand, & James Daak. TIME: 9pm till late- BYO. Right now gotta bigup Foreign Dub !! Ten years ina tha business is a massive achievement - great works !! Good luck with this event ! !